For the seventh year in a row, Apple tops Fortune’s list of the word’s most admired companies. 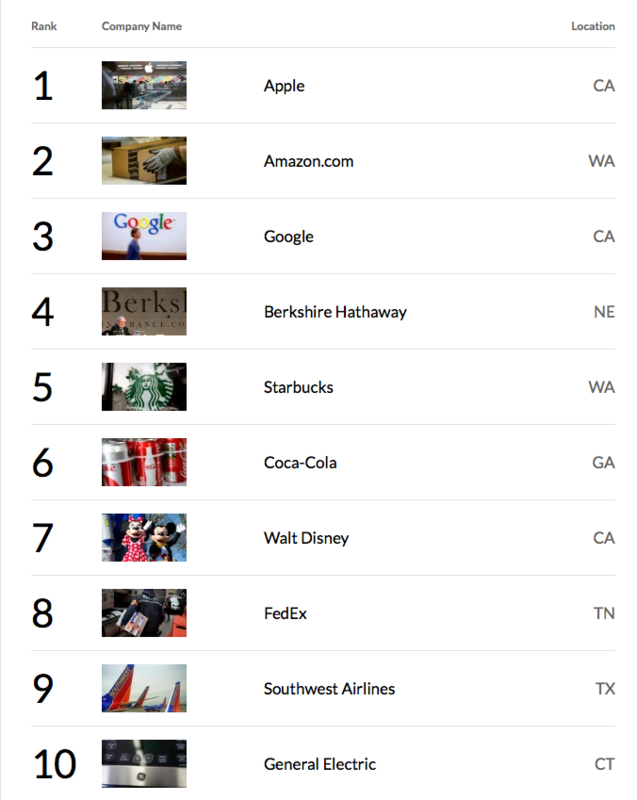 As in 2013, the top 13 companies this year were based in the United States. The top five following Apple are Amazon, Google, Berkshire Hathaway, and Starbucks. The first non-American company on the list is BMW, which took the No. 14 spot. Samsung Electrics is No. 21. The South Korean- based company ranked No. 35 in last year’s survey. The iconic tech company known for the iPhone and other stylish and user-friendly products is back in the top spot on this year’s list, for the seventh year in a row. Apple, the most valuable brand on the planet according to Interbrand, brought in $171 billion in revenues in FY2013 and is flush with cash, but fan boys and girls (not to mention the market) are getting antsy to see its next big product. Bets are on a smartwatch or AppleTV, but the company is also reportedly turning its attention to cars and medical devices. To come up with their annual list, Fortune and the Hay Group start with a list of 1,400 companies each with revenue of $10 billion or more. The rankings are based on information obtained from 3,920 respondents who are asked to select the 10 companies that they admire the most. The last company to rank No. 1 not named Apple was General Electric in 2007. That year, Apple finished at No. 7.